We see it everyday. When it first appears, but never when it goes away. We see it in anxiety and restlessness, tears and laughter. We see it in words and silence. We see it in all shapes, all sizes, all symptoms, all stages. We see the lost. Every day. Nearly 5 million people in the U.S. have dementia. Over half of individuals over the age of 85. Dementia is a vague term that describes several diseases or conditions that develop when nerve cells in the brain die or no longer function as they should. The most well-known type of dementia is Alzheimer’s Disease. It is incredibly rewarding and fulfilling to care for the elderly, but it’s also heartbreaking as we watch the residents and clients who have become part of our family struggle with health issues like dementia. We know you are dealing with it at home too as caregivers of elderly loved ones. That is why we try to share with you tips and resources to help. This time I’m going to talk about warning signs. Although there is no cure for Alzheimer’s Disease and most forms of dementia today, there are treatments that may slow or halt progression or help alleviate symptoms, particularly when started early. In addition, memory loss can also be caused by issues that can be easily remedied such as vitamin deficiencies or medication side effects. When does memory loss become a cause for concern and not just a normal part of aging? 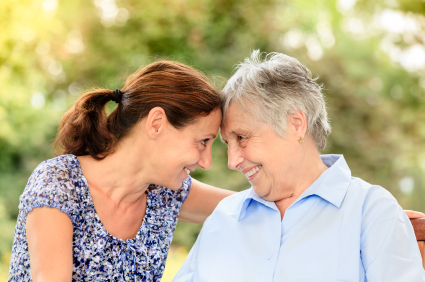 When they struggle to follow a plan or process – when your elderly mother who loves to cook starts struggling with following a familiar recipe or can’t seem to balance her checkbook like she used to, this may be a sign that something isn’t right. When they begin to misplace things with increasing frequency – Did you just think “Uh-oh! I do that all the time!” I do too. I’m looking for either my cell phone or car keys on a daily basis. The difference between normal absentmindedness and memory loss from dementia is the ability to retrace your steps to find the lost item. For example – I can’t find my cellphone. When did I last have it? Right before I let the dog out, because I had just talked to my brother. I go to the back door and find the phone laying on the dehumidifier where I absentmindedly placed it while I let the dog out. The person with dementia cannot retrace their steps. What should you do if you are worried about any of these warning signs in an elderly loved one? It’s time to talk to the doctor. Here’s a nice blog from the Alzheimer’s Association with tips about how to bring up the subject with your loved one and a checklist to prepare for the doctor’s appointment. WRC Senior Services will be offering free memory screenings at our upcoming WRC Healthy Aging Fair on June 4 at Laurelbrooke Landing in Brookville. This does not replace a doctor visit but can help reveal an issue or provide a baseline for future memory testing. If you are already caring for an individual with dementia, you may be interested in the new enhanced dementia services we started offering at Edgewood Heights personal care home in New Bethlehem this month. Join us for an Open House this Sunday, May 19 from 1 – 3 p.m. to learn more. Great advice. I think the best gift family members can give themselves (after assuring their loved one is safe) is the gift of accepting and appreciating the blessing of every moment shared with their loved one, regardless of the right or wrong of their facts. It’s the glimmer in their eyes and the smile across their face that you’ll remember long after the details of the story fade away. So true! Thanks for sharing, Sue.